A man who helped tie a hamster to a firework before the fuse was lit and it was fired into the air has been found guilty of animal cruelty. Steven Gordon, 20, was among a group of friends who filmed themselves torturing the animal on mobile phones in 2005. Police were alerted after Scottish SPCA inspectors viewed a video clip of the incident. 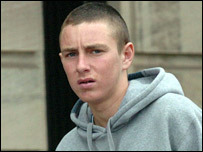 Gordon was convicted after trial at Glasgow Sheriff Court. Sentence was deferred for reports. His lawyer told the trial that the police had got the "wrong man." But officers easily identified Gordon in the dock, with PC John Murray saying he stood out because of his "mouse-like features and big ears." In the 90-second video footage that was shown to the court, Gordon and his friends could be heard loudly laughing and joking as he tips the terrified hamster out of a box in the Possilpark area of Glasgow. The animal desperately tries to wriggle free as one of the gang yells: "Its eyes are gonnae pop oot". The hamster is then clutched tightly as it is taped to a massive rocket stuck into the ground. The fuse is lit as one of the gang shouts: "See you later". The firework and hamster then shoots into the sky and, as it explodes, Gordon and his yob friends howl with laughter. Gordon, from Possilpark, was soon arrested after one officer told the court that the public's response in helping catch the culprits was "better than a recent murder inquiry". However, Ian Sievwright, defending, said the clip was of "poor quality" and to convict Gordon on such a basis would be "a miscarriage of justice". Sheriff Gillian Bryson found Gordon guilty of animal cruelty and culpable and reckless conduct. She said: "I have no difficulty in accepting the evidence of the crown witnesses." Sheriff Bryson adjourned the case until March for reports.